Michael J. Fox has been part of our collective television memories for over 30 years. 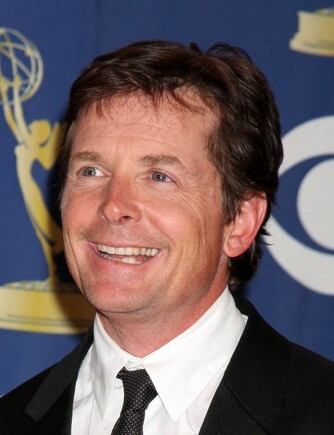 He experienced his first big fame starring as Alex P. Keaton in Family Ties in 1982 (in which he played the conservative son of 1960s liberal political activist parents), a role that won him 3 Best Actor Emmys in the mid-80s. He also starred as Marty McFly in one of the biggest movie trilogies ever, Back to the Future. He went on from there to star in an ABC sitcom in the late 1990s called Spin City, a role that won him another Best Actor Emmy in 2000. Around that time, in 1999 to be precise, Fox announced that he had been diagnosed with Parkinson’s disease in 1991. Parkinson’s is a chronic and ultimately degenerative neurological illness that manifests itself because of the loss of brain cells in an area of the brain that controls coordination of movement. The very tough part of Parkinson’s is that researchers don’t know what causes the loss of brain cells. One of the most obvious and visible signs of Parkinson’s disease is the inability of a patient to control their movements. (Typically, Parkinson’s affects people over the age of 60 so Fox was relatively young to be diagnosed with the disease). Once he made his announcement of his illness, Michael J. Fox left Spin City to not only spend time with his family (actress Tracy Pollan, his wife of 25 years, and their 4 children) but to concentrate of raising money for the treatment of, and finding a cure for, Parkinson’s disease. He did this by establishing the The Michael J. Fox Foundation for Parkinson’s Research. The foundation, according to their site, has raised $325 million to fund research, has supported over 60 clinical trials and has a donation rate of 88 cents (out of every dollar) going towards research programs. By working with Parkinson’s patients, they focus on matching patients with clinical trials (which are the final phase in the development of new drugs and help speed cures). While the connection has not been proved, genetics and possibly environmental factors can play a role in the onset of the disease. Right now, the foundation is focused on a surgical therapy on a brain protein that may slow (rather than just mask) Parkinson’s symptoms. In a recent lengthy interview for the AARP Magazine, Fox talked about how he arrived at accepting his illness and limitations. “My happiness”, he told AARP, “grows in direct proportion to my acceptance and inverse proportion to my expectations”. And AARP points out that, despite having financial resources that most Parkinson’s patients don’t, Fox receives the same treatment available to all Parkinson’s patients. At the time of his diagnosis, Fox’s doctors told him he had 10 more years to work. As Fox himself points out, that was 21 years ago. Even with his diagnosis, he has continued to work sporadically in television, garnering Emmy nominations for turns in Boston Legal, Curb Your Enthusiasm and The Good Wife, and winning another Emmy for Guest Actor in 2009 for the FX series Rescue Me. And in the fall of 2013, Michael J. Fox is coming back to the network that launched his career, NBC, in a new sitcom in which he plays a former NYC local-news anchor who returns to work after being diagnosed with Parkinson’s disease. How great will it be to see Fox back on television on a regular basis and know that you’re not only watching a beloved and great comedic actor back where he belongs but who is the epitome of the old mantra “when life gives you lemons, make lemonade”. He’s a great example of using one’s celebrity to make the world a better place.